Immortality is the concept of having eternal life or a perpetuity of existence. An immortal being has the potential of living an infinite or indeterminate length of time. Immortality can refer to a concept of living in either a spiritual or physical form. The most common form of immortality believed in today involves a spiritual existence of the soul after physical death. The doctrine of immortality is taught in the Biblical Old Testament, with Christians holding to a full revelation of this doctrine by way of the gospel of Jesus Christ. The Bible teaches that death came into the world as a result of sin, but we remain potentially immortal beings that may be resurrected to a new life in heaven. The book of Genesis also clearly implies that humans were designed to live immortal in their physical body before Adam and Eve committed the original sin. 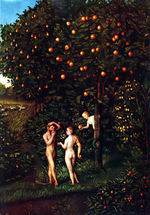 This action which caused God to curse the creation is formally known as the fall of man. Physical immortality is theoretically possible for any lifeform, and the factors which cause organisms to begin to grow old and die remain largely hypothetical. Multicellular organisms are designed so that new cells replace older cells on a never-ending cycle. If a cell is provided all the metabolites and nutrients it needs to survive, its lineage should never die-out. But due to some unknown cause they simply cease. There remains some debate within the theological and creation science community regarding the nature of this immortality. However, many people assume humans were originally designed to be physically immortal, but this ability was somehow linked to the aforementioned Tree of Life. Perhaps the fruit from the tree contained some factor that was able to transform the biochemical nature of humans, slowing or arresting programmed cell death (apoptosis). As a result of the actions of Adam and Eve in the garden of Eden, they brought death to all mankind through their disobedience. This page was last modified on 28 August 2015, at 18:18.